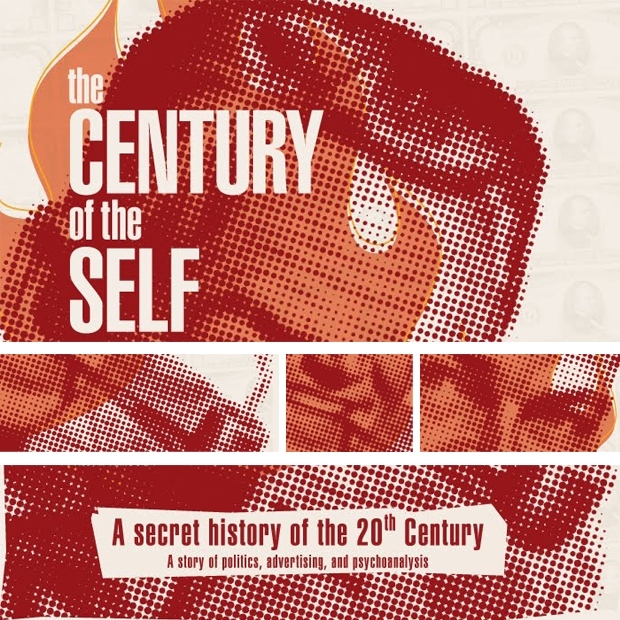 "the century of self... It’s 4 hours long but you’ll get the gist in the first 20 minutes... Basically Sigmund Frued’s nephew Edward Bernays capitalized off of his uncle’s philosophies and created modern day consumerism, before Bernays Americans purchased things based off needs. There was a a time in the 20s when women didn’t smoke in public so Edward Bernays masterminded a campaign to make it culturally acceptable so that companies could sell more cigarettes... it’s that kind of vibe..."
Ever wonder who invented the craft of creating independent studies that produce research unfailingly reporting that products are good for you? Is there a moral issue around giving people what they want by taking away their defenses to manipulation? The Century of the Self is a British television (BBC) documentary film that looks closely at the role of psychoanalysis in marketing and public relations, and how those in power have used Freud's theories to control the “dangerous” crowd in an age of mass democracy. We’ve talked in the past here about manipulation -- both the possibility of feeling free and not really being free and the temptation of retreating into the safety of individual happiness at the expense of the whole truth. The Century of the Self is interesting and relevant because it tells the story of the construction of the most effective apparatus of manipulation in the modern world. The first major blip on the radar comes with the work of Sigmund Freud. The track continues with Freud’s nephew, and agent, Edward Bernays and the invention of public relations as a self-proclaimed nice word for propaganda -- the manipulation of the masses' subconscious animal instinct in order to give them what they really want. "There are certain things in our nation and in the world which I am proud to be maladjusted and which I hope all men of good-will will be maladjusted until the good societies realize. I say very honestly that I never intend to become adjusted to segregation and discrimination. I never intend to become adjusted to religious bigotry. I never intend to adjust myself to economic conditions that will take necessities from the many to give luxuries to the few. I never intend to adjust myself to the madness of militarism, to self-defeating effects of physical violence." Easy answers are also interrogated, and things aren’t always what they seem. These are state-of-the-art mind games, afterall. Like Earth Kitt’s ostensible self-empowering love, or Puff Daddy’s Vote or Die campaign, the human potential movement is revealed not only as a precursor to self-discovery, but also as a doorway to the idea of the forever-unfulfilled consumer. Is this freedom that I'm feeling? A fine line between neglecting and worshiping self-discovery is revealed. Werner Erhardt’s EST training was sort of both revolutionary and fascist in its ability to simultaneously free minds and strengthen the status quo. If existentialism's endpoint was the peeling back of layer after layer until the realization that it was all meaninglessness and emptiness, then here people began to believe that “it's empty and meaningless that it's meaningless and empty.” People were encouraged to invent themselves from this “powerful place of nothingness” from which “something can be built.” They were encouraged to believe that only the individual mattered, that there is no social concern, that “you need be all you think about”, and that it “wasn’t selfish to think about yourself, it was your highest duty.” The original idea was that, through discovering and expressing one's self, a new culture would be born that would challenge the state. What emerged with the help of reformed hippies like Jerry Rubin was the idea that people could be happy within themselves and that changing society was irrelevant. Politics were lost and totally replaced by lifestyle. Socialism had gone personal. In 1970 3-5% of Americans expressed this individualistic perspective, by 1980 the vast majority (80%) did. "Candidates for the presidency of the United States had been pre-packaged and designed for many many years, what was new was an attempt to use very sophisticated, or pseudo-sophisticated, techniques to poll the public psychology, to find out precisely what the desires of the individuals were, and then to come up with a candidate and a platform and images and words that exactly responded to those deep desires."